Snyder is a local author I’ve been following for a while. Spellbent is set in and around Columbus, Ohio. One reason why I enjoyed Spellbentso much was Snyder’s ability to seamlessly weave her fictional pieces of Columbus with the real ones. Only true Columbusites will know which places are from her imagination. A second reason to enjoy Spellbent is Jessie Shimmer. The heroine is a novice witch whose boyfriend (and mentor) is sucked into a demon hole. This is her wake up call. For the reader it’s easy to say Cooper abused the influence he had over her or he doesn’t treat her like an equal partner. For Jessie, this event makes her realize just how dependent she was on him. She doesn’t like it and vows to change things once she gets him back. During the novel some really bad things happen to her (I don’t want to give spoilers) but she has a sharp sense of humor to go along with it and never gives up. I hope future books will let us get to know Cooper better so we can come to understand why Jessie cares about him. The next book, Shotgun Sorceress, is now available but I haven’t read it yet. The third book in the series, Switchblade Goddess, will be available in October. Snyder’s received some good news about Spellbent this week. Spellbent will be available in French. It’s currently on the preliminary Bram Stoker ballot for Superior Achievement for a First Novel. That means a lot of people like it – not just me. I wish her luck and hope Spellbent makes the final ballot. 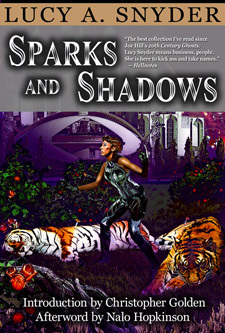 Lucky #9, Denise, is the winner of the autographed copy of Sparks and Shadows. Thanks to everyone for stopping by to say hello and get a chance at winning this great collection of Lucy’s. Lucy A. Snyder is the Bram Stoker Award-winning author of the novels Spellbent and Shotgun Sorceress and the collections Sparks and Shadows, Chimeric Machines, and Installing Linux on a Dead Badger. Her writing has appeared in Strange Horizons, Weird Tales, Hellbound Hearts, Masques V, Doctor Who Short Trips: Destination Prague, Chiaroscuro, GUD, and Lady Churchill’s Rosebud Wristlet. She’s at the World Fantasy Convention this weekend and Shotgun Sorceress went on sale this week. I’m holding the giveaway to celebrate the release date and introduce more people to her work. Lucy and I live in the same city but never connected until the Ohioana Book Festival in May. This is a signed copy of Sparks and Shadows. It’s the only place you can read “Forgetting”, my Story of the Month pick. You can receive an entry by leaving a comment that you’re interested in this book. Contest is open to International entries. The randomizer at Random.org will pick a winner at 11pm Eastern on 11/1/2010. I wanted to provide you with a list of upcoming attractions over the next few months. Today and tomorrow you may see a few book reviews go up that are related to Booking Mama’s 2010 EW Summer Books Challenge. Book Blogger Appreciation Week – BBAW is scheduled this year from September 13th to September 17th. This year I’m going to keep my planned activities light since I’m not sure if my plans include gall bladder surgery or not but you’ll find an interview swap for certain. Back to School Month – For some reason I’ve read a lot of teen/young adult fantasy in one big clump. You’ll find a bunch of reviews and a two part community interview with Artist Arthur, the author of Manifest. Lucy A. Snyder Book Giveaway – Lucy has written an urban fantasy series set in Columbus, Ohio. The first book, Spellbent, is one of my favorite fantasy book reads this year. The sequel, Shotgun Sorceress, will be released into the wild in late October. I have a signed copy of Lucy’s fiction/poetry/humor collection titled Sparks and Shadows to giveaway. During October you might find a review or two of some of her writing. World Fantasy Convention 2010 – Why yes, I am attending the World Fantasy Convention this year. It’s being held in Columbus. I’ve no idea what to expect so we’ll find out together. Gotcha Month – Most of the book reviews for November will be about books featuring dogs. Why November? We don’t know the Resident Corgi’s birthday so we celebrate his Gotcha Day instead. Not all of the reviews are written yet but I promise you’ll find a variety of dog stories. A big thank you to Marcia at The Printed Page for hosting Mailbox Monday. A lot of new books flew into the house this week courtesy of the Ohioana Book Festival. This is the fourth year of the festival in which Ohio authors are featured. Starting from the top of the stack is Don of the Dead by Casey Daniels. This is the first in a series of mysteries featuring Pepper Martin, an heiress whose family fortunes has turned sour. She must get a job. The only job she can find is that of a cemetery tour guide. Through an on the job accident, she finds she can communicate with the dead. In this first book she helps a deceased mafia boss hunt down his killers. Each book in the series focuses on a ghost from a different decade. Casey said the series is a light read. Sounds perfect for porch reading. Casey currently lives in the Cleveland area. Next is Embers by Laura Bickle. Anya is an arson investigator in Detroit by day. At night she’s part of a ghost hunting team. Anya is a psychic medium who believes a supernatural arsonist is setting fires to summon a fiery being. Time is running out before the spell will be complete. Laura lives in Ohio. Linda Robertson‘s Vicious Circle is next. Persephone Alcmedi is a tarot card reading witch. Witches don’t mix with werewolves but Persephone’s best friend is one. Life is piling up for Persephone – her grandmother gets kicked out of her nursing home, her best friend is murdered, and she’s been asked to kill a vampire. The little thing at the top of the pile is the cedar and sage soap with a tag on it. It represents what Persephone smells when she puts on the leather jacket of Johnny, a werewolf she’s attracted to. Both Persephone and Linda live in Cleveland. Spellbent by Lucy A. Snyder. One of my favorite books so far this year and not just because it’s set in Columbus. Jessie Shimmer is a magic student trying to summon up a rain storm to end a drought. During the spell she loses her teacher (and lover) into a portal and a demon is on the loose. Lucy lives in a suburb about 15 minutes away from me. All the Way Home by David Giffels is a memoir about finding (and repairing) the perfect home in Akron, Ohio with his wife and infant son. At one time, Akron employed over 35% of the production workers involved in the rubber industry. The home David finds is a challenge. Once the home of a rubber executive it’s fallen into disrepair of the worst kind. Animals live inside the house and the roof has more holes than shingles. David lives in Akron. Under Glass: The Girl with a Thousand Christmas Trees by Jen Hirt is a memoir about the family greenhouse business. Her family life has been turned upside down and the greenhouse land has been sold to a nationwide pharmacy. The greenhouses are torn down but her family won’t. Jen grew up in Valley City, Ohio and currently teaches in Pennsylvania. 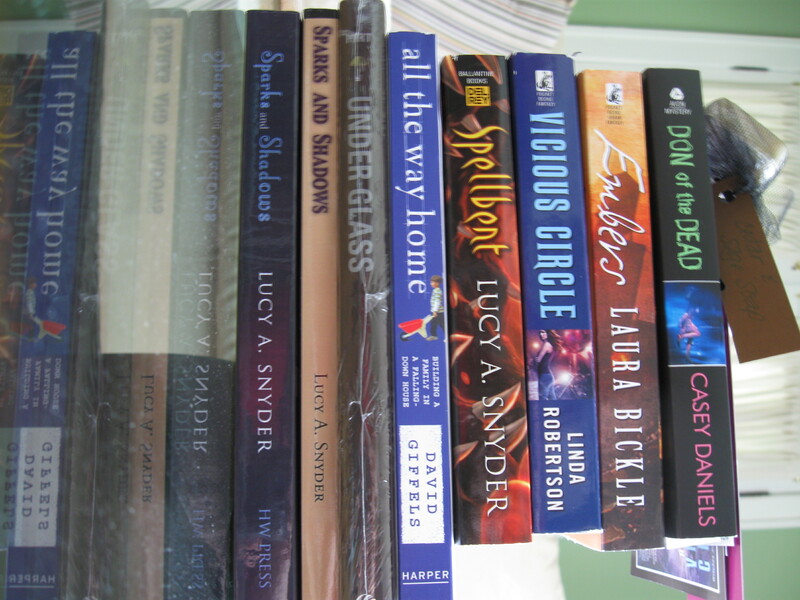 Sparks and Shadows (two copies) by Lucy A. Snyder are at the bottom of the pile because they’re the largest. Contents include poems, short stories and essays. The one with the tan colored spine is the second edition and the contents are nearly the same as the first, limited edition. It has a new introduction and one poem swapped out for another. At Lucy’s suggestion I bought the second edition as a future giveaway for my readers. I’ve already read a few of the stories from when they were available on her web site a few years ago but I want to get more read before doing the giveaway. 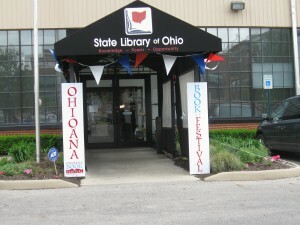 It wasn’t until May 2008, the weekend of the Ohioana Book Festival, that I first heard of it. Friday was the opening night for Jeff Smith’s exhibit at the Wexner Center for the Arts. Both Harvey Pekar and Joyce Brabner were in attendance. The next morning they were off to the Ohioana Book Festival. The Jeff Smith festivities kept me busy all weekend. Last year I didn’t attend because I knew it would be a madhouse. How else would some of these kids get Jeff Smith’s autograph? I finally made it this year. First I looked at the list of authors and made a preliminary list of the books and authors I wanted to meet. After a while I stopped really reading the information and began to skim it. My list was getting quite long. The State Library of Ohio is about nine minutes from my house. First I stopped off at Barnes and Noble to pick up the books I wanted but I could not find a single one. I asked on Twitter and was told there would be a Barnes and Noble shop on site. The lobby area was turned into a cafe of sorts with food for attendees. Beyond the circulation desk were tables and chairs in front of a podium for readings. Beyond the library stacks was the main festival area. It was an extremely large room. Tables were setup for the sponsors and partners around the perimeter. Barnes and Noble had several long tables with books and a cash wrap area. They were even able to honor my member card for a discount on my purchases. One corner had a podium and chairs. I imagine this was for the panel discussions. In the middle of the room were tables groaning under the weight of books with authors behind them. I know readers like pictures but I didn’t take any. Because it was lunch time, a lot of authors were eating at their tables – I didn’t want to have them worried about food in their teeth and I thought it might be inconsiderate of the other authors who didn’t get their pictures taken. Call me an odd bird. First I stopped to see Lucy A. Snyder. I was of course, my babbling idiot self, when I introduced myself. (I’m fine with award winning filmmakers but authors in person are another story.) Several years ago I went to see her husband at a reading and when she was chatting with people I used that as my excuse not to introduce myself. She and I have been friends on LiveJournal for years. I bought a copy of Spellbent (one of my favorite books this year) and a limited edition of Sparks and Shadows, one of her short story collections. We talked a little bit about Spellbent and I completely overlooked the Stoker Award on her table. (Bad me.) Lucy was one of the featured authors at this year’s festival. Next I saw Linda Robertson, the rocking and rolling author of the Persephone Alcmedi series. I picked up a copy of Vicious Circle, the first in the series. She shared a story about the time she had a book signed by an author and the author misspelled her name. Linda had two sets of soaps at her table and I took one of the cedar and sage soaps. It’s supposed to be what the main character smells when she puts on the leather jacket of Johnny, a werewolf. Seated at the same table as Linda was Laura Bickle, the author of Embers. When I was telling Linda and Laura about all the Ohioana authors I hadn’t heard of, Laura joked she was a noob. Embers was released last month and in June she’s releasing another book titled Dark Oracle under the name Alayna Williams. Want to hear something funny? Laura’s been doing blog tours and I left a comment on one of last month’s stops. Lastly I was able to meet Casey Daniels. I picked up a copy of Don of the Dead, the first in the Pepper Martin Mysteries. Pepper is a cemetery tour guide who solves ghosts problems. There are six books so far with a seventh on the way. Casey let me know each ghost is from a different decade. This mystery series sounds like a unique concept and the ghosts from different decades are bound to keep things fresh. I picked up books from Jen Hirt and David Giffel but they were away from their table doing readings and I imagine getting some lunch. Jen Hirt’s book is fairly new. It’s a memoir about her family’s greenhouse business. I heard of David’s book from The Thurber House author series but didn’t get a chance to go to the reading. It’s about restoring an old house that needs a large amount of work. Think of the house the Bouvier Beale women (of Grey Gardens fame) lived in and you have an idea of what he was up against. 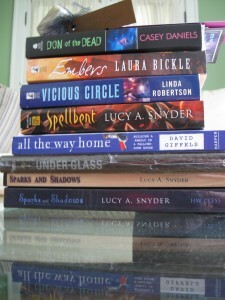 I’m looking forwarding to reading all of these books and going to the Ohioana Book Festival in 2011.